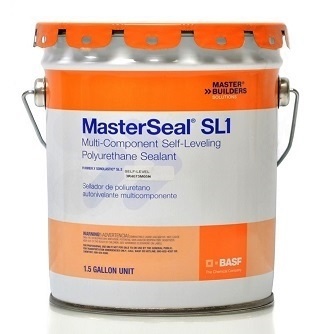 PRODUCT: MasterSeal SL-1 (formerly called Sonolastic SL 1), Limestone Color, One-part, Self-leveling Polyurethane Expansion Joint Sealant. 2-Gallon Pail. Price/Pail.Self-leveling Polyurethane Concrete Expansion Joint Sealant. 2 Gallon Pail. Price/pail. DESCRIPTION: Sonneborn SL 1 joint sealant is a one-component, self-leveling, UV resistant, exterior grade, non-priming polyurethane sealant designed for creating, sealing and waterproofing all type of concrete and metal expansion joints up to 1-1/2" in width. It has 300 PSI Tensile and 800% Elongation. For joints wider than 1-1/2", SL2 is recommended. SL1 requires no mixing and bonds to many materials without a primer, including concrete, masonry, metals, fiberglass, etc. Use together with Backer Rod to create proper design of expansion joints. With 800% elongation and 350 PSI tensile strength it is recommended where flexibility as well as abrasion and puncture resistance are required. Not recommended for asphalt sealing, asphalt expansion joints, or contact with asphalt products. 2-gallons yields about 328 lineal ft. of 1/2" x 1/4" joint size. See Application Yield Rates for other sizes. ALBION #DL-45-01 BULK LOAD CAULK GUN, 1-1/2 PINT, DELUXE MODEL, ALL METAL, 2 x 14 INCH BARREL, WITH #32-88 3/8 METAL NOZZLE. PRICE/EACH.